With the cost of solar continuing to fall rapidly (50% in the past five years) and electricity prices rising steadily, if slowly, the approach of solar grid parity is near. The following chart illustrates the trajectory of solar cost and electricity price, hinting at the coming intersection. 1 The chart compares the cost of a residential solar installation to the cost of electricity for a residential property. The numbers are national averages, and do not reflect the wide variation in the cost of electricity (from $0.067 per kWh in Seattle to over $0.170 per kWh in New York City, for example). In particular, the two lines have been converging rapidly since 2007. The key moment for solar is the crossover, when electricity from solar – without subsidies – costs less than grid electricity. The following analysis identifies this moment of “solar grid parity” for the top 40 metropolitan areas in the United States (representing just over half of the national population). For the list of the metro areas, see the Appendix (although Hawaii is already at solar grid parity, we did not include the Honolulu metro area as it ranks #53 in population). This is the second of five parts of our Rooftop Revolution report being published in serial. Read part 1 here. Download the entire report and see our other resources here. In our analysis, we focus exclusively on residential solar grid parity, rather than commercial solar (and commercial electricity prices) or utility-scale solar with electricity sold on the wholesale market. To determine the year of grid parity for major cities, we compare the cost of solar power installed on a residential property averaged over an expected project lifetime – the “levelized cost” – with the expected change in the average residential retail electricity rate. The cost of capital for residential solar installations is calculated at 5% based on the historically low interest rates that persisted in 2011. We also assume that homeowners will finance 80% of the cost of the installation. To account for the changing value of money over time, we use a 5% discount rate (equal to the cost of capital) and a 3% inflation rate (the historical U.S. average) to account for the smaller cost of payments made on debt in later years. The project life of solar was estimated at 25 years, based on the the longevity of early installations and the quality of current solar panels. Operations and maintenance costs were estimated to be 1% of the initial installed cost, a slightly higher assumption than that used in many other studies. The output of the solar array is based on the local solar insolation data from the National Renewable Energy Laboratory’s PVWatts calculator. Panel out-put was forecast to degrade by 0.5% per year. We used the same installed cost for solar nation-wide, ignoring variations that currently exist in the solar market. We assume that as the national market for solar grows, regional variation in prices will become insignificant. Based on these assumptions, the levelized cost of solar today – without any incentives – varies from around $0.19 per kilowatt-hour (kWh) in Los Angeles to $0.29 per kWh in Seattle. For more discussion on the cost of solar, see the Appendix or for some context, see the Sensitivity Analysis. Currently, there are a variety of incentives that reduce the cost of solar electricity. At the federal level, a 30% investment tax credit and accelerated depreciation (worth an additional 20% discount) significantly reduce the levelized cost of solar. In many states and utility service areas, rebates and other incentives are added to the federal incentives. Even residential solar can be competitive with grid prices, especially with the rising popularity of third-party ownership models. Solar leasing allows residential property owners to have solar installed with no or low upfront cost, and typically means they will see an immediate reduction in their electricity bill, even when factoring in the lease payments to the third party. The third party is able to capture the federal tax incentives (including depreciation, otherwise not available to residential users) and therefore can compete favorably with those making cash purchases of solar power for their homes. The cost of these incentives is not insignificant. 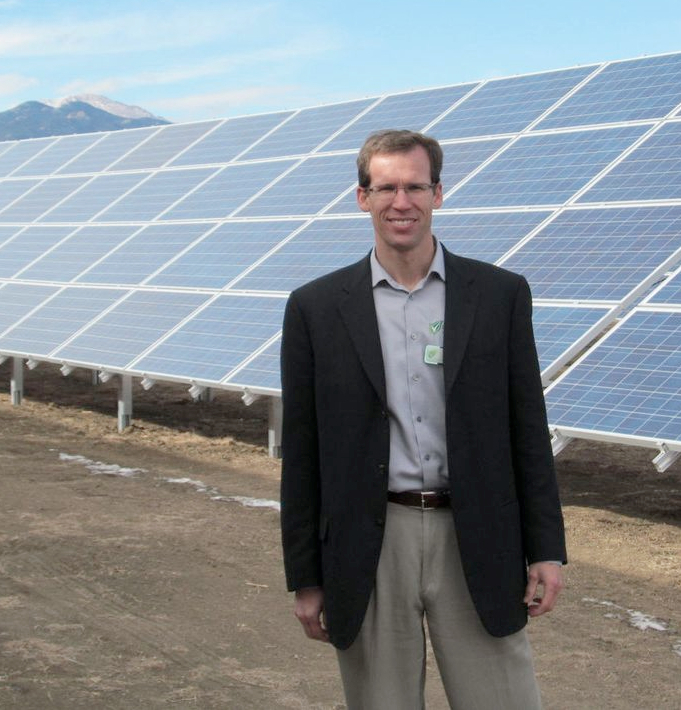 For example, the federal tax credit allows solar projects to get back 30% of the installed cost. Claimed by nearly all solar projects, in 2010 the tax credit amounted to nearly $1.6 billion (for 878 megawatts of solar at an average price of $6.20 per Watt).7 The following chart illustrates how the exponential growth of solar means an exponential growth in the cost of the tax credit, despite significant forecast price decreases. Values after 2011 are forecast, with a best fit line estimated for solar capacity additions, and a 7% annual decline assumed for the installed cost of solar. The cost of the tax credit will reach $22 billion a year by 2016 and the tax credit isn’t the only subsidy. The federal government estimates that accelerated depreciation for solar and geothermal projects costs about $300 million per year, forecast to rise to $7 billion by 2016.8 With solar capacity growing rapidly and costs coming down, the following analysis suggests that it may be time to re-evaluate incentives for solar power. For more on this issue, see Planning for Phasing Out Incentives. To avoid complication in the analysis all solar costs in this report, with the exception of the preceding section, reflect the unsubsidized cost of solar power. Using the unsubsidized cost of solar reported earlier for each metropolitan area, we contrast it with each city’s average residential retail electricity price, as reported by the PVWatts calculator (and derived from the Energy Information Administration). Once again, there is wide variation. Prices varied from $0.067 per kWh in Seattle to $0.175 in New York City. 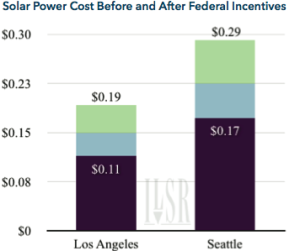 To determine when cities reach residential solar grid parity, we assumed that electricity prices would continue to rise at 2% per year (the historical average9) and that the cost of solar would decline at 7% per year (less than the 5-year average of 10%). It is possible that the cost of solar will plateau, or that electricity prices will rise much more slowly, and we have conducted a sensitivity analysis to examine some of those contingencies. The following chart illustrates the number of Americans in the top 40 metropolitan areas who could go solar for less than the retail grid electricity price by year, from 2011 to 2027. San Diego is the first city at grid parity, in 2013. Seattle is the last, in 2027. Geographic regions are listed on the chart when cities in those regions reach grid parity. For a table showing the chart data through 2021, see the Appendix. 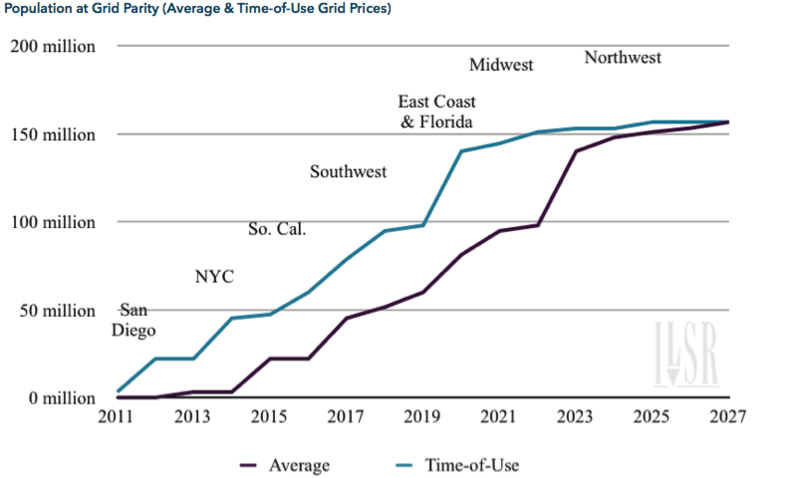 In the short-term, Southern California reaches grid parity with moderately high electricity prices and excellent sunshine, with New York coming soon after due to particularly high grid prices. By the end of the decade, 1 in 4 Americans in the largest metropolitan areas could go solar at better than grid prices. Although the comparison above between solar and average retail electricity prices is accurate, it misses an important element of grid electricity pricing and the value of solar power. In some areas of the country, utilities have begun to offer “time-of-use” pricing that varies the rates for electricity during times of the day (and seasons) to reflect the higher costs for generating power during times when demand is particularly high. In general, these high demand (e.g. high cost) times are on hot, sunny afternoons when air conditioning loads are highest. Of course, these hot, sunny and high demand days (and high grid prices under time-of-use pricing) tend to coincide with high levels of potential solar power production. This means that solar can provide a lot more economic value to the utility by reducing demand and providing extra generation at a time when it’s most needed. The following two graphics illustrate how solar PV systems produce more electricity during the times of day and year when electricity demand is high. 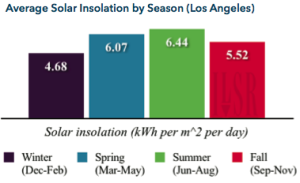 For example, a solar panel in Los Angeles will deliver a disproportionate 28% of its annual electricity during summer months (June through August) and also deliver 43% of its daily electricity output during peak pricing hours. 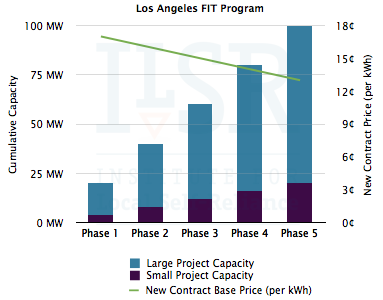 The overlap of solar panel output with high electricity prices means that in Los Angeles and other communities, the utility’s time-of-use pricing plan makes solar power pay back faster, because the customer is offsetting more expensive electricity than average with their solar array. And if set up properly, any net excess generation flowing back to the utility grid should be compensated at peak power prices. 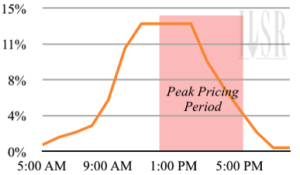 The following chart illustrates the time-of-use pricing plan for the city of Los Angeles municipal utility that charges higher prices during certain day-time hours during the summer months of June, July and August. The availability of time-of-use pricing means that comparing solar to the average grid electricity price underestimates its value to a residential customer. A solar panel will reduce a homeowner’s consumption from the grid during the most expensive time periods. Therefore, we ran the solar grid parity analysis a second time, increasing the retail electricity price by 30% (to reflect the time-of-use value of solar).10 In this scenario, solar grid parity advances by two to three years for most cities, as shown in the chart below. Fifty percent more people achieve grid parity by 2021 – nearly half of all Americans – with a time-of-use pricing plan compared to data using average retail electricity prices. One could conclude that implementing time of use pricing should be a cornerstone for any policy advocates seeking to make solar competitive sooner. As distributed solar generation expands significantly, the financial advantage of peak pricing may fade, but in the near term it’s a pricing mechanism that can make solar more affordable. Most people think of grid parity in simple terms: “is the cost of solar electricity lower than grid electricity right now?” But with electricity prices rising 2% per year over the last decade, installing solar immediately could save money in the long run even if the current cost of solar electricity is higher than grid prices. 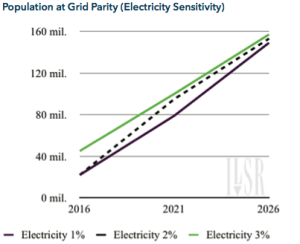 Thus, we modeled a third pricing scenario, called “economic grid parity,” and the concept can accelerate the year of grid parity. Economic grid parity happens because rising electricity prices make solar installed today increasingly worthwhile over time. The cost of solar electricity is fixed, based on the cost to install the array. It will continue to provide electricity with no fuel cost and with minimal maintenance for 25 years or more. 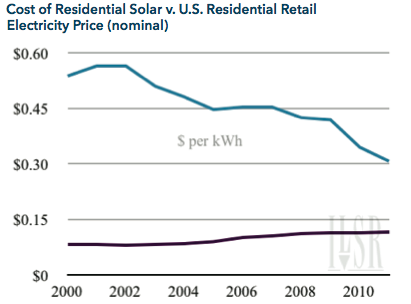 Grid prices typically increase, however, making the value of solar greater over time. The adjacent chart illustrates the concept for Los Angeles. 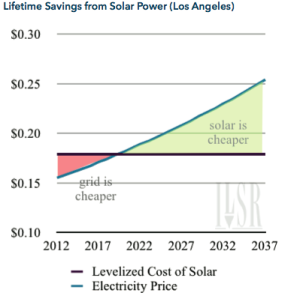 Grid electricity is cheaper than rooftop solar for the next few years, but then the two flip. Over 25 years, the savings from solar grow significantly. To calculate the year of economic grid parity for each city, we simply matched up the lifetime cost of solar (the levelized cost over 25 years) to the expected cost of grid power in the year it was installed. Each year, the grid price rises by an expected 2%, while the cost of solar stays the same. We use the net present value11 of the costs and savings to determine the economic grid parity year. 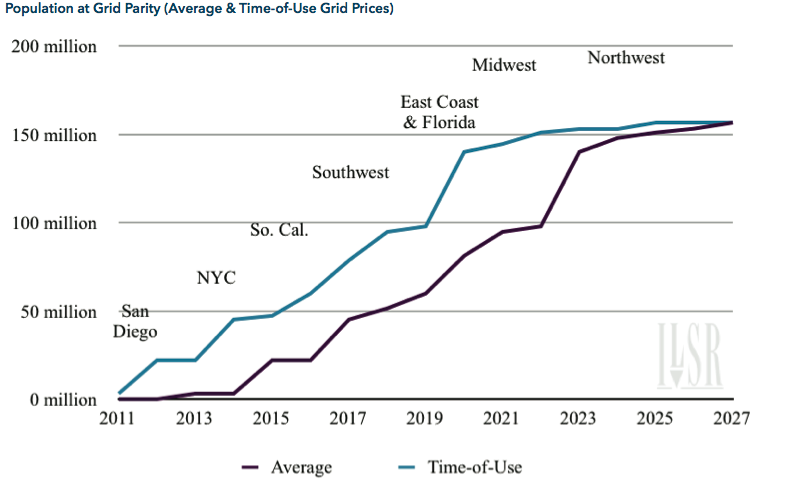 In general, using this method accelerates solar grid parity by an average of two years for most major metropolitan areas, as shown in the following chart. A detailed table is in the Appendix. The choice of measuring stick matters a great deal for solar grid parity. With time-of-use prices implemented and a careful look at the lifetime value of solar power production, the next five years could bring one-third of the U.S. population to solar grid parity. 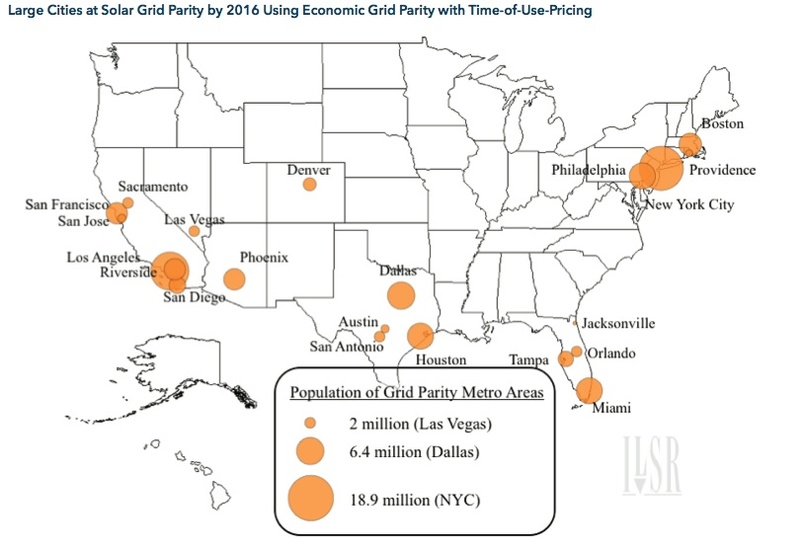 The following map shows the metropolitan areas that could reach grid parity by 2016 with time-of-use pricing and using “economic grid parity,” representing a total population of 96 million. With time-of-use prices implemented and a careful look at the lifetime value of solar power production, the next five years could bring one-third of the U.S. population to solar grid parity. Although we’re confident in our various solar grid parity analysis assumptions, conditions may change in unexpected ways. 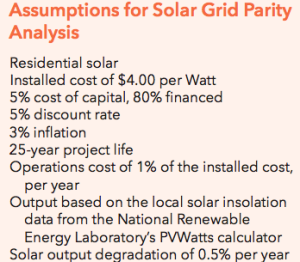 This section examines the impact of variations in the assumptions used for the solar grid parity analysis, including the inflation in grid electricity prices, the cost of solar, a potential plateau in the cost of solar, and the initial installed cost of solar power. Electricity prices are relatively stable, so the small range tested in the sensitivity analysis also has a relatively small impact on the eventual coming of grid parity (see adjacent chart). Since the role of solar costs plays a disproportionate role and is less predictable than electricity prices, our sensitivity analysis reveals how changes in the solar cost assumption could have a significant impact on the overall results. A ±2 percentage point change in the annual cost trajectory of solar could change the number of Americans at grid parity by 30 million in either direction by 2026 (the chart doesn’t show the full impact because our universe is artificially constrained to the top 40 metro areas). A plateauing of solar costs after 2020 could severely limit the expansion of grid parity thereafter, but interestingly a starting cost $1.00 per Watt higher is no worse (in the long run) than a 1 percentage point slower decrease in solar costs. Some might argue that even the sensitivity analysis underestimates is too bullish on solar costs, but the world market suggests otherwise. At the end of 2011, while the average installed cost of U.S. solar lingered at $5.20 per Watt, Germans installed solar at an average cost of $2.80 per Watt.12 The enormous difference suggests plenty of room for downward cost movement.